The new HBO doc tells the story of a man whose life was tied to the mammoth persona he cultivated under an impossibly bright spotlight. André Roussimoff’s life was so dominated by size that in “Andre the Giant,” the documentary about his life and career as a professional wrestler, he’s introduced by his feet. Just walking along, you can see that his shoes dwarf those of the person walking with him. Much of Jason Hehir’s film, premiering this week on HBO, centers on that idea — that this man who stood over 7 feet tall was larger than any life could give him. Roussimoff’s public persona has been well-documented. As a public figure, cultural icon, and (as the film posits) at one point one of the most famous people in the entire world, Andre the Giant was recognizable simply by existing. The value in a biographical portrait of a mammoth, beloved figure like this is to provide context for the man himself, the life outside the ring. “Andre the Giant” provides some of that, beginning with his teenage years moving away from a small village in the northern France and his first steps towards taking advantage of his physical attributes for a career in wrestling. Footage of early fights from the mid-1960s shows a young man already towering over his opponents, using his size and charm as twin weapons. From there, most of the rest of film follows what many wrestling fans and some wrestling agnostics probably already know. Working on the independent regional wrestling circuit, Roussimoff worked his way up through the ranks before becoming one of the shiniest jewels in the WWF crown. Through the lens of wrestling historians and Roussimoff’s peers who also became household names as a result in the mid-80s wrestling boom, “Andre the Giant” shows how the advent of cable TV helped turn him and those he fought into global stars. One of the tantalizingly short sequences in “Andre the Giant” comes near the height of that fame. The small diversions into the town of Ellerbe, North Carolina show a gentler, reserved Roussimoff desperate for a place where he could escape the limitations of his frame and his notoriety. Through candid photos and some unguarded home video footage, we see tiny glimpses of a counterpoint to who he was in any royal rumble. These intimate moments of what his private life was like are one of the few ways this movie offers up insight that comes directly from him, rather than filtered through the experiences of people who were his partners in keeping an entire industry alive. Outside of some “60 Minutes” footage and those handful pieces of candid archival shots, there’s very little in “Andre the Giant” that isn’t under a glaring spotlight. The very making of this movie is in a difficult grey area to begin with: Dive deeper for the “real” Roussimoff and you betray the solace he sought, but focus on bolstering his wrestling legacy and you start to erase the person he was outside the singlet. 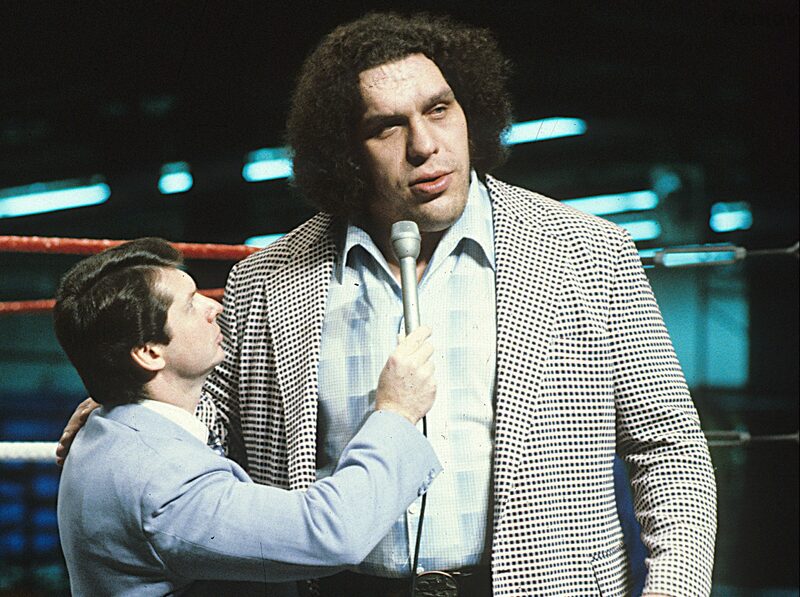 Much of the on-camera interviews in “Andre the Giant” err toward the latter. Conversations with people like WWF guru Vince McMahon and announcer Gene Okerlund serve to fortify Roussimoff’s legend as a wrestler. Whether it’s stories about his drinking prowess (played mostly for laughs or gasps), his legendary presence in any kind of room, or Ric Flair making not-so-veiled jokes about his anatomy, these are stories like something out of a Paul Bunyan fable. It’s telling when McMahon admits that he would make up stories just to see what people would believe. It’s further proof of how hard it is to separate reality from the glossy sheen of pro wrestling. That’s what makes Flair’s involvement such an explicit reminder of what the “30 for 30” installment “Nature Boy” was able to do last year. It helps that Flair was able to speak to his experiences personally — Roussimoff passed away in 1993 — but there’s not much of a similar effort to truly grapple with Roussimoff’s offstage life in the same honest way, except to repeat the idea that his size thrust him into a life no one could be prepared for. “Andre the Giant” does make frequent references to the idea that throughout his life, Roussimoff was treated as a commodity. McMahon speaks about “delivering” him to various other wrestling operations around the country. The conversation about other people giving him a stage name is akin to a bunch of ad men trying to brand or product to sell supermarkets. Pro wrestling is an entire industry built around an illusion, and it’s something that “Andre the Giant” often nods at, but often seems to brush aside in favor of focusing on the deep resonance it has with its fans. In lieu of having Roussimoff speaking directly to his experience — most of the archival video footage in the film is him in character — Hulk Hogan takes center stage through a sizable portion of the film. Even as Hogan and Roussimoff became magnanimous rivals, before Andre the Giant’s heel turn in the latter years of his career, to have so much of the Hulk Hogan origin story in this film seems like filler in place of comparable stories and visual evidence unavailable from Roussimoff’s own life. For wrestling fans, a large portion of the WWF part of Roussimoff’s life is him in the ring. From his humble origins through the heights of WrestleMania III, the venerant tones that people use when speaking about Andre the Giant’s in-ring prowess is specifically designed to evoke a certain amount of wonder that may still resonate with people who don’t know The Iron Sheik from Junkyard Dog. The most sobering impression “Andre the Giant” leaves is that through a melding of person, character, and even the film itself, there may not have been all that much to separate in the first place. “Andre the Giant” airs Tuesday, April 10 at 10 p.m.